Any New Year’s party is incomplete without some sort of countdown to welcome in the new year! Although you could easily use an app on your phone, nothing beats the satisfaction of making your own! This is exactly what The Soldering Station has done using a seven segment display and an Arduino Uno. The instructions are very thorough so you should have no trouble getting your countdown timer ready in time for the 31st of December! To get started checkout the following link. 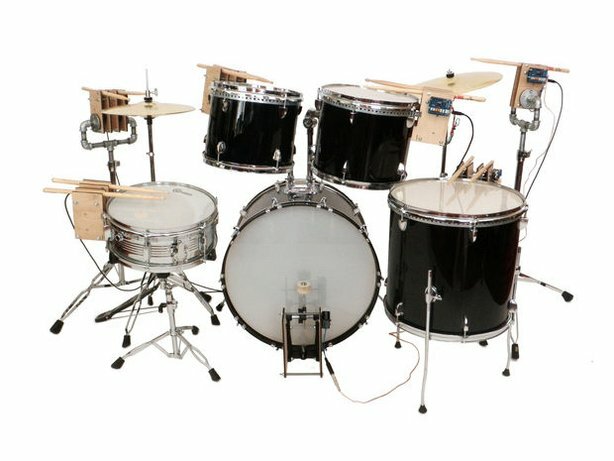 You can see the kit in action in the video below. For many families the TV is an important part of the living area, however it can be very desirable to keep your TV hidden away when it is not in use. Not only does this keep your TV protected but it also prevents kids watching TV when they aren’t meant to! A great solution to this problem is to have a TV lift cabinet which keeps your TV hidden but at the push of a button you lifts your TV out of the cabinet so it can be used. To find out more about how you can build your own TV Lift Cabinet checkout the following link. A fundamental aspect of many home automation projects is the ability to connect an Arduino to the internet to allow easy control of inputs and outputs from anywhere in the world. A crucial part of achieving this connection is to set up a MAC address for your Ethernet connected Arduino. A MAC address is a unique identifying number that is needed in the data link layer of a TCP/IP network. To find out more about how to setup MAC addresses checkout the following link. 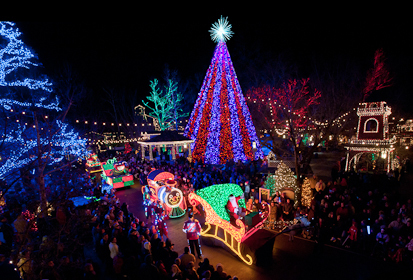 With Christmas fast approaching now is a great time to build a Christmas light controller and add some spectacular effects to your lighting display. Controlling LEDs is something that Arduino is particularly good at which makes it perfect for controlling Christmas lights. There are many potential projects and combination of colours and patterns that are possible. 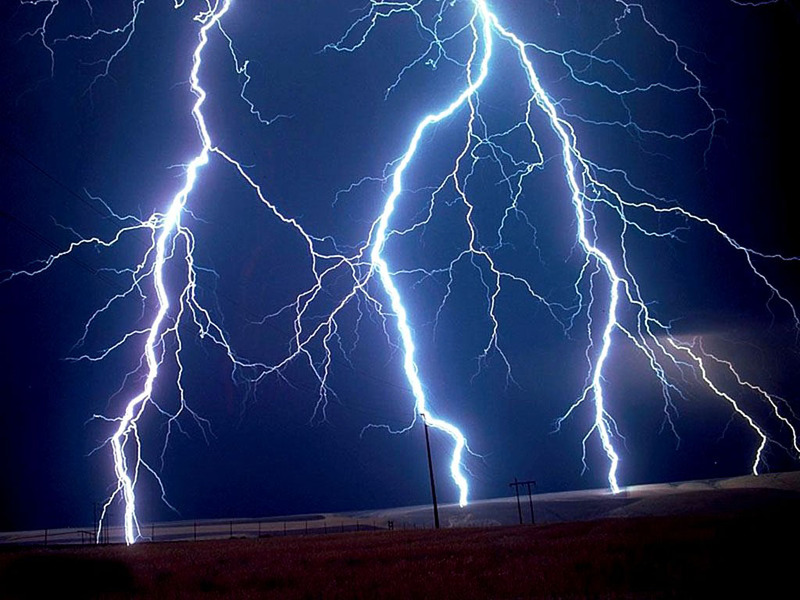 The following link gives some great tips on making your own lighting display. 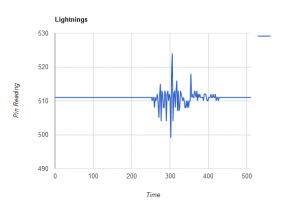 This blog post is about learning how to use arrays with Arduino. 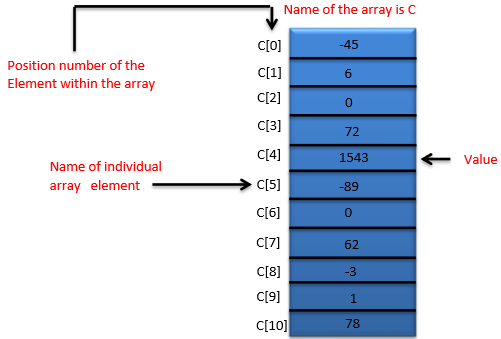 Using arrays in your code can make your code faster and much more readable. For example, rather than defining a new variable for each pin used in your Arduino code, having an array allows you to assign these all to one array. To access each pin in the array you simply define which address of the array you would like to access. If you would like a more thorough explanation of how Arduino arrays work to implement them in your code make sure you checkout the following link. 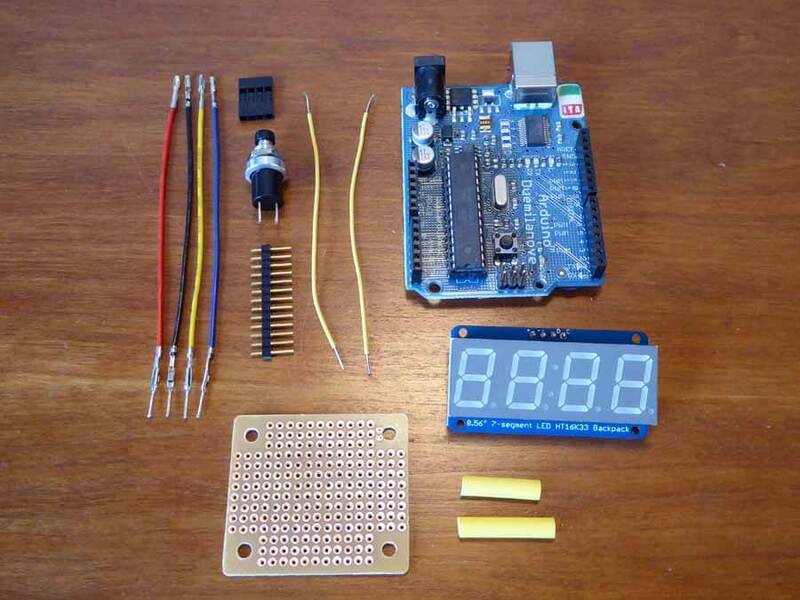 If you are thinking about getting started with Arduino, but don’t know where to get started, the Freetronics Experimenter’s Kit is a great way to learn the basics. The kit includes a wide range of parts including a servo, sensors, lights, buttons, a sound module and more. Importantly, a Freetronics Eleven Arduino-compatible board is included to ensure that the kit contains everything you need to get started with Arduino. All these great parts would be useless without some form of instructions which is why we have developed a comprehensive project and instruction booklet to get you started. Check out the product page to find out more. Are you a huge fan of The Simpsons or any other TV show? 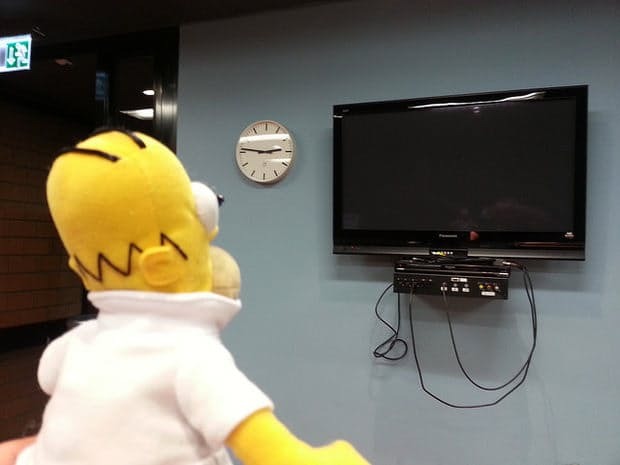 Thomas Amberg has created a humorous “Homer” puppet which automatically turns on the TV anytime The Simpsons is scheduled to be on. The project works using an Ethernet connected Arduino which automatically checks an online TV program and then uses IR LEDs to turn the TV on. You could very easily adapt this project to turn it into a less Simpsons centric smart TV remote. To find out how you can build your own smart Homer checkout the following link. It’s the Arduino Due-compatible board with Freetronics additions including Ethernet network connectivity, MAC address chip, microSD storage, optional PoE, upgraded power supply and more. 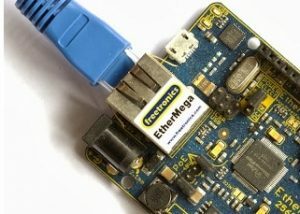 For more information on this powerful board, check out the EtherDue product page. Wouldn’t it be cool to build your own full sized outdoor scoreboard? This is exactly what joevpt has done. The scoreboard uses 24 DMD displays which are controlled by 6 Arduino boards. 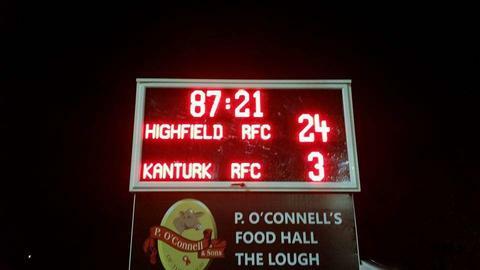 Impressively the scoreboard updates automatically from an iPhone app which is used to keep track of the scores at joevpt’s rugby club. If you want to read more about this project checkout this thread on the Freetronics forum. 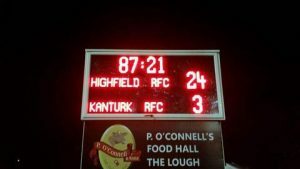 If you are impressed by this project and want to build your own scoreboard, why not checkout the range of displays offered by Freetronics. They are simple to use, yet very bright for indoor and outdoor situations. Available in various colours, the 32 x 16 LED matrix can display text and graphics easily, and can be daisy-chained together for extended displays. For more information, find out more about the Freetronics Dot Matrix Displays here. Sometimes it can be really handy to quickly access information such as the current temperature, humidity and light level. It can be very interesting to collect this kind of data from your home or office and to observe trends over time and in different spaces. One effective way of collecting this kind of data is to build a simple home environment monitor as Brian has done. Brian’s home environment monitor uses a Particle Photon to collect data from a number of sensors. 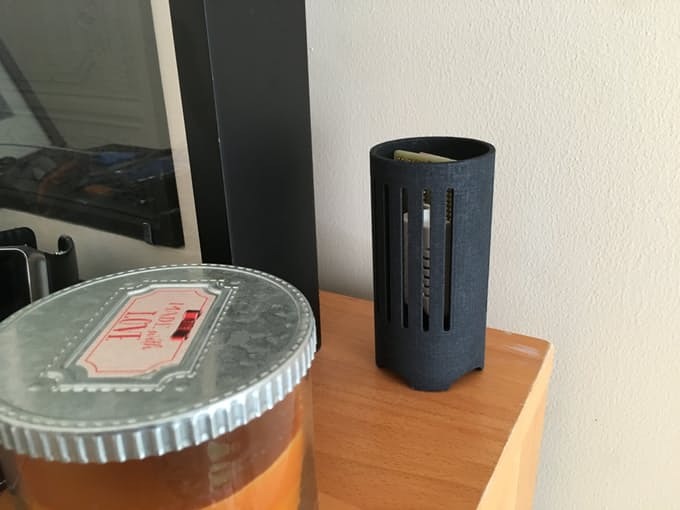 The Particle Photon and the sensors are all housed in a very tidy looking 3D printed case! If this project interests you, check out the following link to get started. 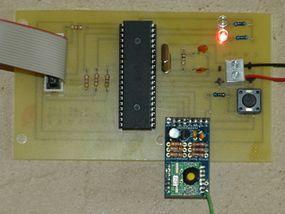 Looking for a temperature sensor to use in this project? Why not check out the Freetronics Humidity and Temperature Sensor Module?